There’s a certain perverse pleasure in waiting to see what disastrous policy initiatives Republicans can develop, like watching a Jerry Lewis movie. You enjoy the unwinding disasters, almost in disbelief, just waiting to see how bad it can get. Attempting to repeal Obamacare for the 50th time, for example, when we come in dead last for healthcare outcomes among all developed nations…. That’s something, really. It requires a kind of supreme lack of imagination. We endure the worst rates of heart disease, lung disease, obesity, and diabetes among all the developed nations on Earth. We are last in positive outcomes, but we spend the most–outstripping all rivals in flushing money down the insurance toilet without any actual return on investment (or ROI, as the smart MBA kids like to say). So the natural conclusion for the conservative movement is to repeal anything that would correct that situation, right? All this might suggest that the right doesn’t actually care about outcomes, or maybe it’s some unfathomably clever political ploy. Like how, every six months or so, they actively seek to plunge our economy back into an ice bath by holding the debt ceiling hostage. Or again, maybe it’s just the right gone wild in their usual productive cycle of ginning fake outrage over fake scandals (Benghazi! IRS!) and destroying any attempt at a sane economic policy which, I have to admit, is par for the course. After all, our band of antediluvian brothers’ idea of economic progress is to repeal the minimum wage. Yet, there are moments when even a cynic must pause. Ten years ago, for example, would anyone have wagered that our Supreme Court would gut the 1965 Voting Rights Act, invalidating section four and opening the way for conservatives to pass some of the most restrictive voting laws in the country? Within 2 hours of that court decision, Texas arranged a voter ID law and redistricting map both of which were blocked in previous years for their discriminatory tendencies against blacks and Latinos. It’s not like this should have come as a surprise, either. The Texas Republican Party’s 2012 platform specifically called for the repeal of the 1965 Voting Rights Act. The only people who didn’t see it coming, apparently, were the five Justices who concurred in the decision to gut the act. One must conclude they were willfully blind to reality, or criminally stupid, or, more likely, they were perfectly aware of the outcome, and that’s precisely why they formed their decision. This brings us to an interesting question. Suppose the recent antics of the right aren’t just gross stupidity, poor analysis, or general loss of contact with reality? But, rather– it’s opposite. Suppose it is simply this: the right is actively seeking to disenfranchise millions of citizens to retain political power, keep sick people from adequate health care to ensure continued profits for a dysfunctional healthcare system, and weaken the middle class and labor movements so that big business–their primary constituent–can avail themselves of cheap labor in perpetuity. If the latter is true, then maybe the activists in North Carolina have it right. The Reverend Barber and the NAACP have developed a sustained protest dubbed “Moral Monday” in reaction to anti-abortion legislation, voter suppression laws and cuts in public school teacher pay the conservatives of their state have enacted. Thousands have showed up at the North Carolina state house throughout the summer. 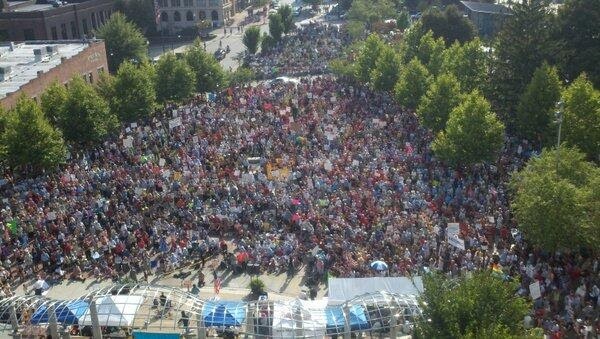 Five thousand activists alone showed up in Asheville, North Carolina on Monday, August 5th. Close to a thousand have been arrested over the course of the summer in acts of civil disobedience. After all, if the right isn’t entirely divorced from reality, their motives aren’t hard to decipher. Why gut the middle class economy, destroy any attempt at healthcare policy, restrict women’s rights, mock a black President and– a local note– plant a Confederate Flag just south of Richmond, Virginia (home of the ex-Confederacy, where millions of slaves were brought to be auctioned off to the highest bidder a little over 150 years ago) unless that is exactly what you’re seeking? To turn the clock back to that sunny time when blacks slaved like raisins in the sun, and poor whites were tenant farmers eking out a hard life’s wage, half of which went to pay their landlord? Sans any government protection, much less ‘healthcare’….This, after all, is the essence of the Confederacy, and, at bottom, the essence of the right-wing laissez faire economic model. It would not be the first time in human history that we’ve taken a step or two back. Some folks might say I am exaggerating, because outside of a government predicated on a wealthy elite’s supremacy, the destruction of the middle class, the elimination of social services and the return of institutions that look and act like slavery or tenant farming, would the right-wing agenda really be all that bad? I’m glad you asked, because even if we were to accept the feudal living arrangements the far right’s economic agenda promises, there is one other area where they would actually prove worse. According to the Texas Commission on Environmental Quality, 30 Texas towns are about to run out of water due to global warming induced droughts, and– wait for it — fracking. Why? Because fracking uses water humans need to survive. The oil and gas industries are draining Texas of water in order to break up the earth so that oil may be extracted to produce gas that runs cars that lead to global warming which further exacerbates the lack of water … that humans need to survive. The oil and gas industries consider the cost of this degradation–that is, the draining of Texas’ aquifers so that humans have nothing to drink–an ‘externality’ (another word those smart MBA kids love); and to the extent that they think about them at all, most of the humans in Texas are probably also considered externalities, as are their children and their children’s children, etc… Except the fetuses, naturally. That’s just the way the far right rolls. We could put this another way, of course. We could talk about the human cost of such a far right economic model that reduces humans to a plus or minus on a ledger sheet. We could suggest that, as humans, strictly speaking, we cannot drink oil, and we cannot eat money. Barnhart, Texas has already run dry. Moral Monday, anyone? Busy day here at APV, this Saturday marks our first fundraiser, here’s a link if you haven’t heard about it and are planning on being in Richmond this weekend, and everyone is hustling to get their work done and be ready for the big throw down. With that in mind, here’s some light reading for your Wednesday afternoon. Lind notes that new technologies in fossil fuel extraction push back the date at which the industrial world will begin to seriously run out of carbon based energy, and he thinks this is a very good thing. I.e. there’s centuries worth of coal just waiting to have the mountains scraped off it, new fracking technologies mean there’s enough natural gas for another hundred years, there’s lots of oil in shale and tar sands in Canada and the high plains and new advances in undersea extraction will allow us to get at all that methane under the sea floor (not to mention all the methane trapped in ice and permafrost that global warming is helpfully releasing). Even better it’s all here in North America, so we don’t have to go to the Mid East, and buy/steal it from those nasty Arabs.. Oh and another thing, “Global Warming” is sort of a scare tactic by the “Greens” who want everyone to live like Hobbits in some idilic medieval agricultural paradise… and, even if it is really as bad as everyone says, it won’t be that bad, and we’ll all adjust and be fine, or at least the kind of people who work for well funded Washington think tanks will be fine (I’m sure science will come up with a way to raise Martha’s Vineyard a couple feet when the seas eventually do rise). Oh and, if you have to move away from hydrocarbon based fuel… nuclear power is a great alternative and we need more and more of it, cause it’s so clean and cheap and safe… hell, I can’t even figure out how they turn a profit on it, it’s so cheap, and clean and… er safe, right? If this seems well, a little too good to be true, welcome to the club. The letters section at Salon did a good job of raking him over the coals so I’m not going to do an extensive critique here, but I will point out a few things and then I’ll post some interesting links that commentators volunteered. Lind hypothesizes that there’s something on the order of five times as much oil and natural gas available as was formally thought, but as I mentioned last week in another post, the oil companies are going after this stuff precisely because the easy to get oil and gas is running out. This stuff is hard to get to, it’s dirty and needs much more refining, it makes a terrible mess of the environment and in the case of fracking, the technology is very new and the risks it poses are just now becoming apparent. Fracking poses a real threat to the water table, and if you haven’t seen the Academy Award nominated documentary Gasland I suggest you have a look for a quick seminar on the law of unintended consequences. Methane is a green house gas, big time! Methane makes CO2 look like an amateur when it comes to green-house gasses. There’s real fear that as the ice caps melt and the permafrost in the arctic thaws, massive amounts of sequestered methane could be released leading to a truly catastrophic effects on the earth’s climate. Lind seems to think this is also fine, all that methane is just sitting there waiting to be burned for fuel to power our washing machines and ipads, never mind the war, pestilence, famine and death that will surely follow the massive climate disruption this will cause. This is indicative of Lind’s thinking throughout the article, so what if the monsoon fails in India, so what if the western desert spreads into the great plains and the corn belt moves north, so what, as long he doesn’t have to use mass transit and besides, the Canadians aren’t exactly gonna stand in our way are they? And yes, I’m being hyperbolic but these are the same thought processes that brought us the war in Iraq, the hurricane Katrina debacle and the BP oil spill, “Don’t worry, nothing can go wrong, and if it does, then, we’ll think of a plan to fix it”… or not. I’m not that worried that we’re about to run out of oil completely and be plunged into a Road Warrior world, where desperate gangs fight for supremacy amidst the ruins of civilization (the fevered dream of so many of those fat, camo wearing, gun hoarders you see at certain rallies), or that the climate will change drasticaly in the next weeks or months. But I do worry that the kind of inside the beltway complacency that Lind manifests in this essay, will prevent us from doing the hard work that is needed now so that we don’t have to face the many bad scenarios that come from forever waiting and procrastinating until it’s too late. Here’s Andrew Leonard’s take down of Lind in Salon today. Finally, what to make of this sort of thing is always hard, something tells me that the powers that be will try and keep solar and other renewables expensive and exotic as long as they can until they can figure out a way to put a meter on the sky. Still, we encounter so much bad news, so much of the time, it’s nice to report something good for a change.